Ripley’s Aquarium of the Smokies is a big hit with both children and adults! There is something for people of all ages in this attraction, which is why it’s perfect for families. When you stay in one of our cabins, you’ll get one free adult admission ticket for every paid night stay! When you take advantage of this offer, you’ll be able to explore one-of-a-kind experiences you won’t get anywhere else. Splash around with stingrays, come face-to-face with penguins, and venture into the middle of Shark Lagoon in a glass bottom boat! You’ll be able to see jellyfish, sharks, a sea turtle and more when you visit Ripley’s Aquarium of the Smokies. Who doesn’t love mini golf? 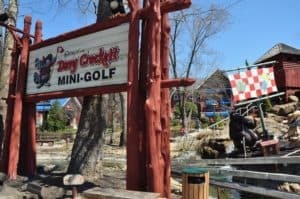 At Ripley’s Davy Crockett Mini-Golf, you’ll be able to play 2 uniquely themed golf courses – that’s 36 holes of fun for the family! Compete against your family members and see who comes out on top. If you get a hole in one, you’ll win a free game! When you stay in our Gatlinburg cabins, you’ll get one free adult admission ticket for every paid night stay. Take advantage of the discount and gather the family for some good old-fashioned mini-golf fun! Rowdy Bear Mountain is home to Gatlinburg’s number one mountain coaster! The coaster is a gravity-propelled alpine mountain coaster that reaches speeds up to 35 miles per hour. The best part is that you control your own speed! The coaster allows both single and double riders, along with parent/child riders! The parent must be at least 16 years of age, and the child must be at least 3. This is perfect for an outdoor family adventure in Gatlinburg. Our Gatlinburg attraction package for Rowdy Bear Mountain includes one free adult admission on the coaster for every paid night stay in our cabins. Ride the coaster with your family and enjoy gorgeous views! If you’re in the mood for a sweet treat, head to Mad Dog’s Creamery! Mad Dog’s Creamery has a full selection of hand-dipped premium ice cream, soft serve, sundaes, banana splits, milkshakes and funnel cakes! Satisfy your sweet tooth by visiting Mad Dog’s Creamery and choosing from 24 different flavors of ice cream! With this attraction package, you’ll receive a free double scoop of ice cream on a waffle cone for every paid night stay. If you stay in one of our pet-friendly cabins, not only can you bring your furry friend on vacation, but you can bring them to Mad Dog’s! Mad Dog’s has doggie treats and toys, along with picnic tables and water bowls for your four-legged friend. This is a great package to take advantage of if you bring your pet on vacation! Our beautiful cabins are perfect for families! We have cabins with 1 bedroom, to cabins with 6 bedrooms to accommodate groups of all sizes! When you stay with Stony Brook Cabins, not only will you enjoy our attraction packages, but you’ll be able to enjoy amazing amenities such as stunning mountain views, hot tubs, internet and fully equipped kitchens. Browse all of our Gatlinburg attraction packages and start planning an unforgettable family vacation! If you’re looking for a Smoky Mountain attraction to visit that can keep the whole family occupied all afternoon, look no further than Anakeesta in Gatlinburg! This unique amusement park has everything from mountain coasters to ziplines and so much in between. To help you make the most of your trip, here are 5 of the top things to do there. Whether you’re a fan of the arts or are just looking for a unique place to shop, the Gatlinburg Arts and Crafts Community should be at the top of your list. With items to browse from over 100 artists and craftsmen, finding the perfect souvenirs and gifts is easy! To help you make the most of your experience, here’s what to expect when you visit this fantastic attraction. If you’re looking for something fun and memorable to do on vacation, you can’t go wrong with a visit to one of the many Ripley’s attractions in Gatlinburg! From mini golf to interactive museums, there’s something for everyone to enjoy! To help you plan for your trip, here is a little more information about these can’t-miss stops. Breakfast is the most important meal of the day, and there are plenty of places for you to enjoy it in Gatlinburg! Whether you’re a lover of pancakes or waffles, a fan of omelets or fried eggs, there’s a restaurant here to satisfy all your early morning cravings. To help you start your day off on the right foot, here are some of the top places to eat breakfast in Gatlinburg.